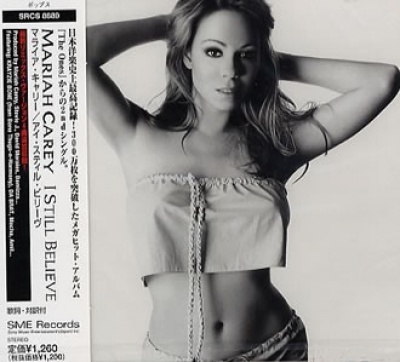 From her #1's collection, Mariah Carey released her version of the Brenda K. Starr hit "I Still Believe" as a tribute to the singer who (as legend has it) gave Carey her first break in the music business. Carey's version was a Top Five hit, largely due to the maxi-single's packaging and marketing, which featured a flesh-baring Carey on the cover and contained five completely distinct versions. The single opens with Carey's original version of the song, which pales somewhat in comparison to Starr's more passionate interpretation. The second track, "Stevie J. Clean Remix," featuring raps by Mocha and Amil, bringing to mind the backing music one would find in an early-'70s scary Saturday morning cartoon. The other urban mix, titled "I Still Believe/Pure Imagination," features raps by Krayzie Bone and da Brat, and sounds like a completely different song. That version took on a life of its own, becoming its own hit on the U.S. R&B charts (for all intents and purposes, it should have been its own song, titled "Pure Imagination," because, beyond lyrical references, it has absolutely nothing in common with the original song). The mix is, nonetheless, breezy, laid-back, and typical of mid-'90s urban/hip-hop, and features da Brat saying "lose the ego," all the while self-aggrandizing herself. Finally, two dance/house mixes are included. The first is "Morales' Classic Club Mix," which is a standard, but well-made dance remake, and is quite smooth, with Carey giving a great vocal performance. The second is "The Kings Mix," which is a more straight-on house mix, with no real verse and chorus, and again, has virtually nothing in common with the original song. So, in effect, this "single" is more of an EP than anything else, which is fine, and explains, as is often the case with Carey products, why it was such a success.